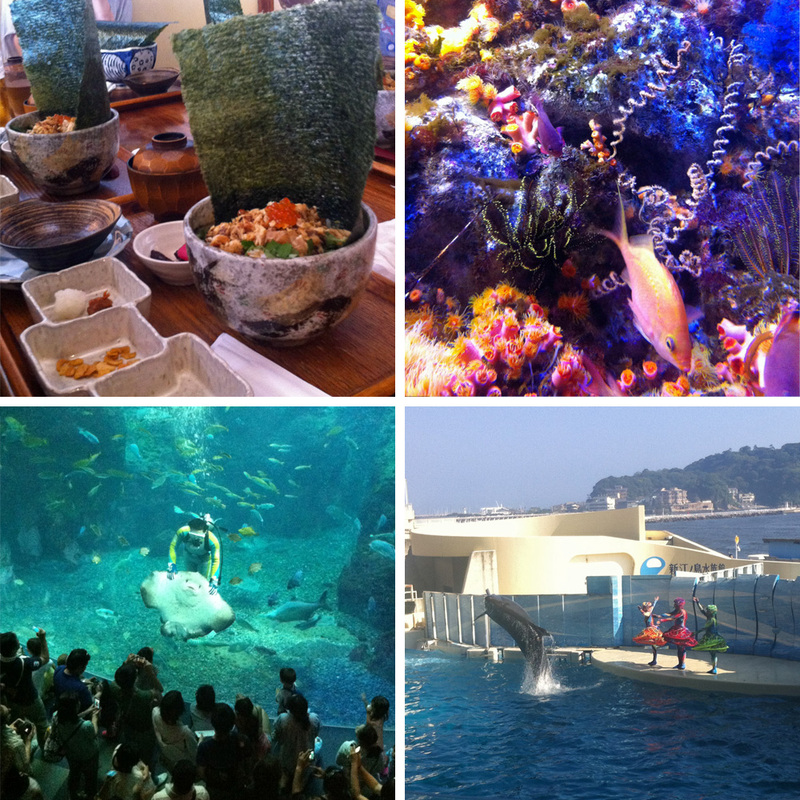 This weekend I went to Enoshima. I don’t know why it has taken me 3 years to get there; it’s only an hour from Tokyo by train but it feels a world away. I left the city heat behind me and spent an afternoon near the sea with friends. Lovely! We accidentally caught the dolphin show, which was surprisingly entertaining. I usually dislike animal shows but this one was choreographed with dancing, singing, synchronized swimming girls who sat inside big clear balls and were pushed across the water by a false killer whale. Everyone around me was like, “What the hell?” but in a good way. 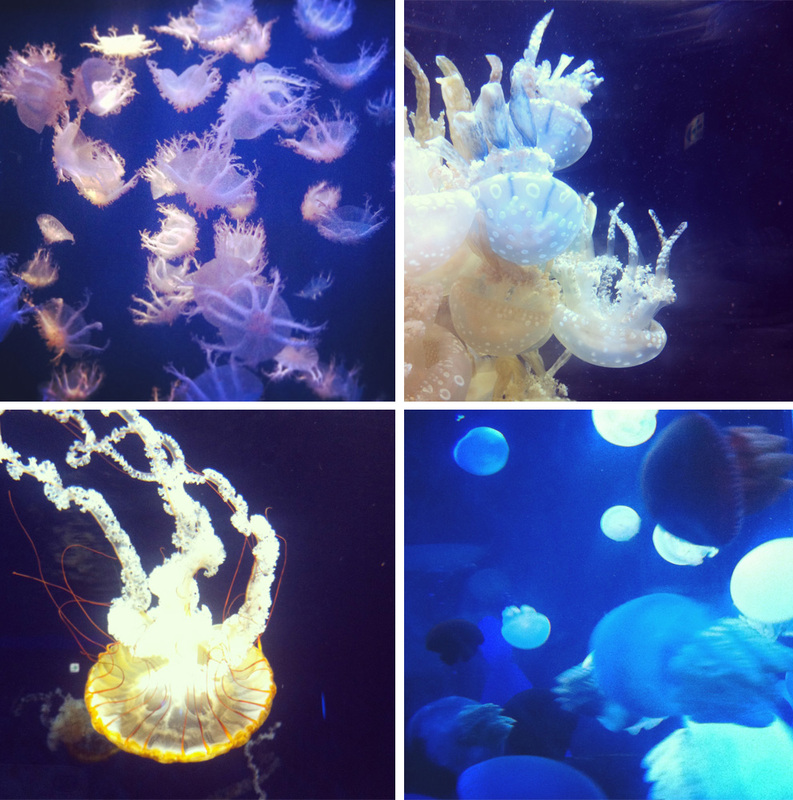 Dolphins and smiling rays put up a good fight, but the jellyfish fantasy hall was the real shop-stopper. That, and when I caught a seal pooping. 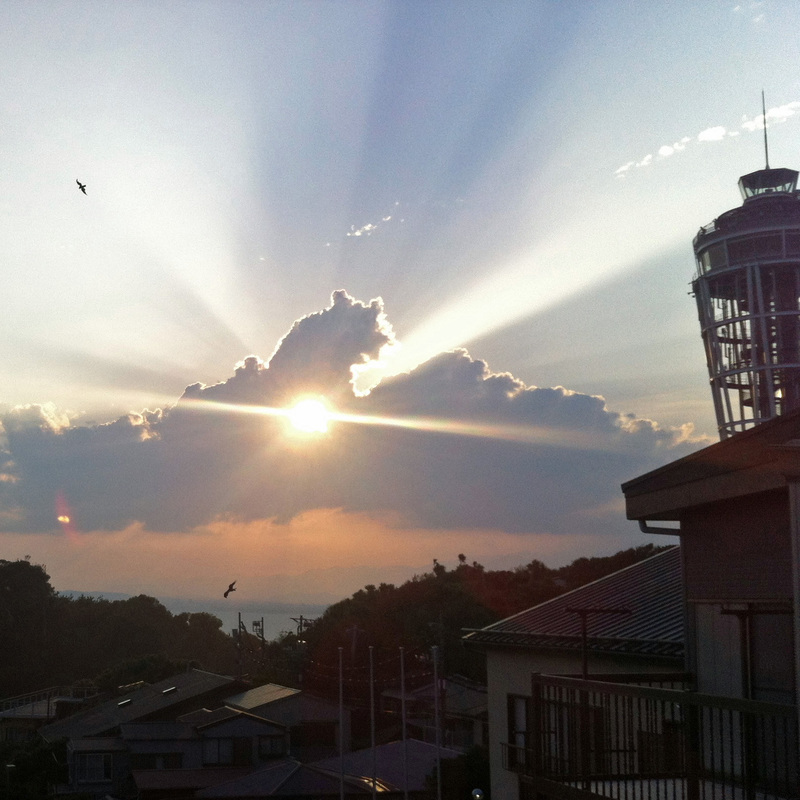 After a walk along the small streets of Enoshima to the top of the peak, we were rewarded with a pretty sunset. And back to Tokyo we went. 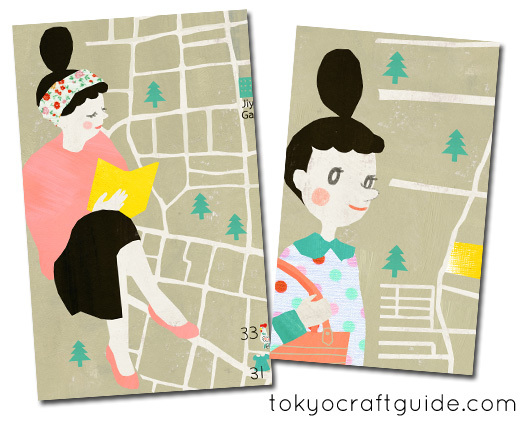 I am so thrilled to announce that the new and improved Tokyo Craft Guide is here! Well, it’s over here, but you know what I mean. 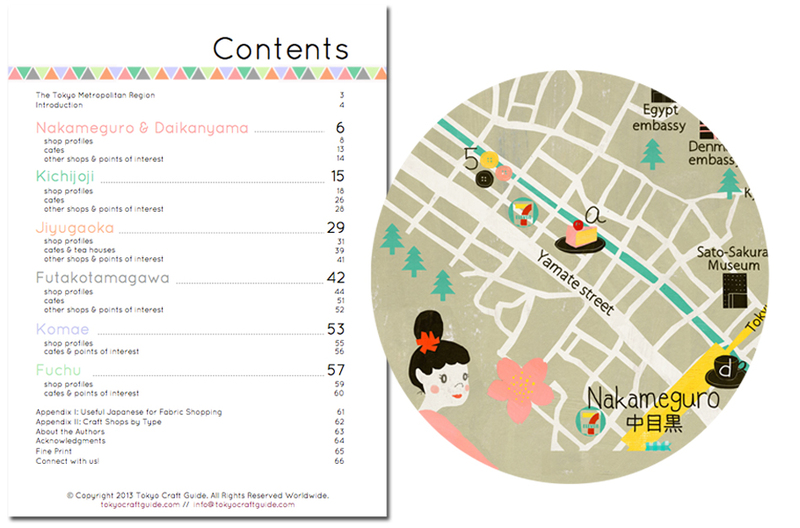 Beautifully illustrated by Hana of ilikesleeping, and researched and written by myself and the lovely Frances of Miss Matatabi, the Tokyo Craft Guide is packed full of our favorite off-the-beaten-track craft shops in Tokyo. We’re giving you all of our secrets, my friends. 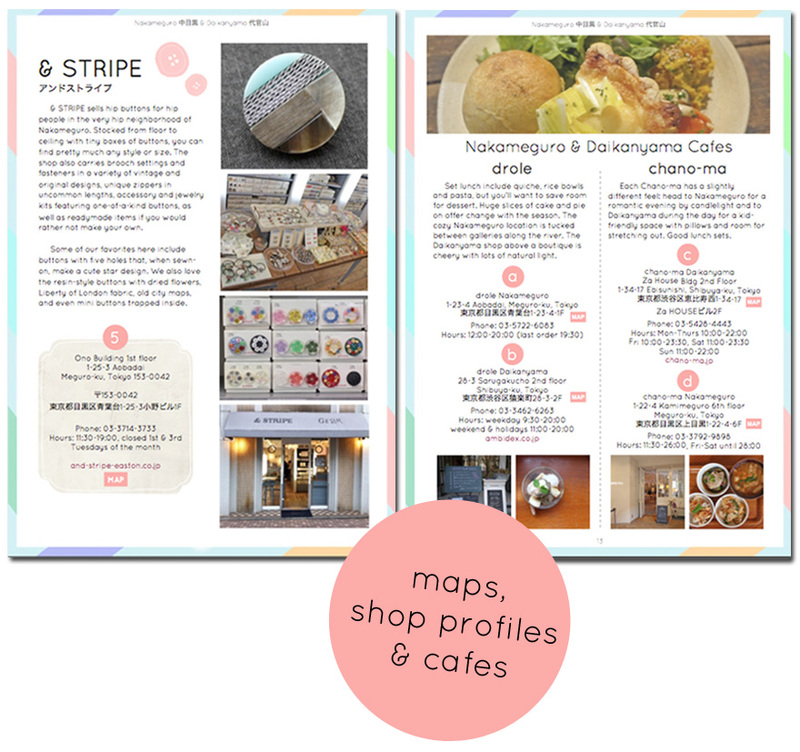 Six neighborhood maps help you navigate our curated lists of craft shops and cafes. We also throw in a few parks, temples, a ramen shop, and a few bars. But mostly we talk about crafts: over 50 shop listings describing what is special or unique about each shop, where to go for paper or fabric or yarn, who speaks English, and a few words of Japanese to help you in case they don’t. I’ll still be offering the same free content from the previous Saké Puppets guide, it has simply moved over to the Tokyo Craft Guide blog. Over there we will be profiling larger shops like Yuzawaya and Tokyu Hands, and also posting interviews and craft events happening around Tokyo. But we’ve reserved the special stuff for the book: small, independantly-owned places, young shop owners who stock their friend’s creations, old shop owners who have been around for 50 years and stock beautiful vintage glass buttons — those are the places that make craft shopping in Tokyo so wonderful. I’m in love with the illustrations in this book. Each map guides you on a treasure hunt, sending you into the neighborhood to find secret craft-gold. Also, never have I looked so relaxed or my bun looked so perfectly huge! 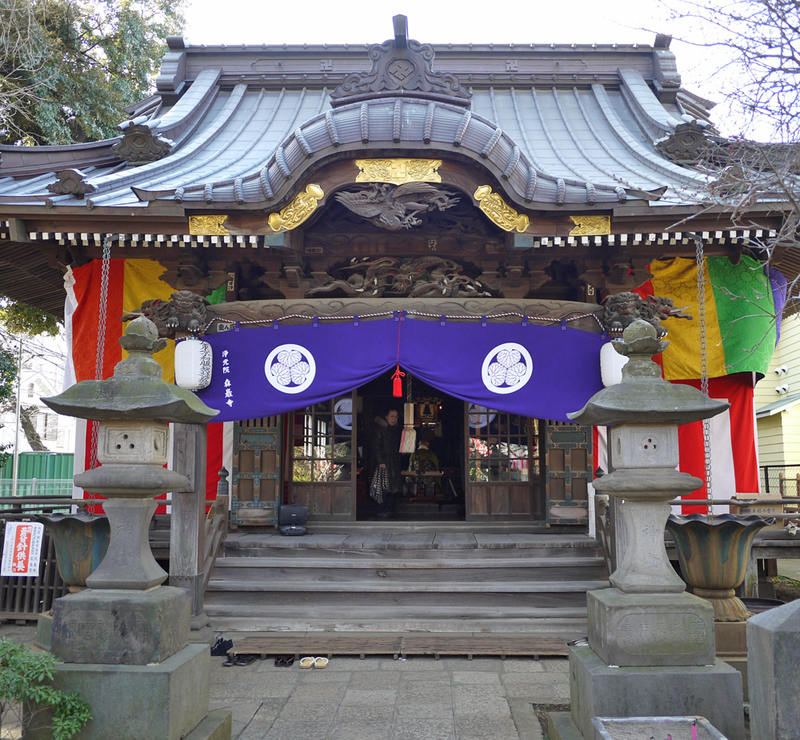 On Friday I went to a local harikuyou 針供養 festival. 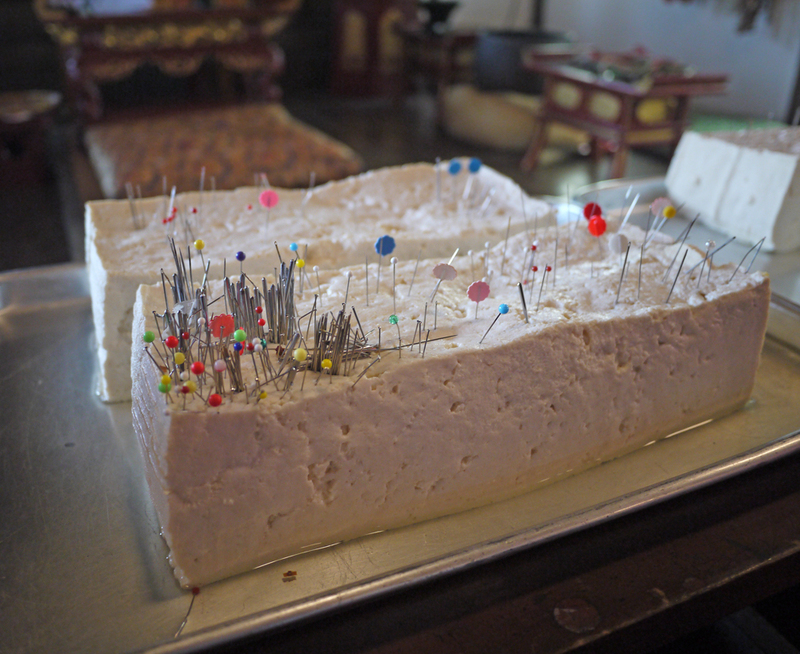 February 8th is a day to pay respect to your old sewing needles by sticking them in tofu. The idea is that your needles have worked hard and have served you well, and so deserve a soft place to live our their final days. 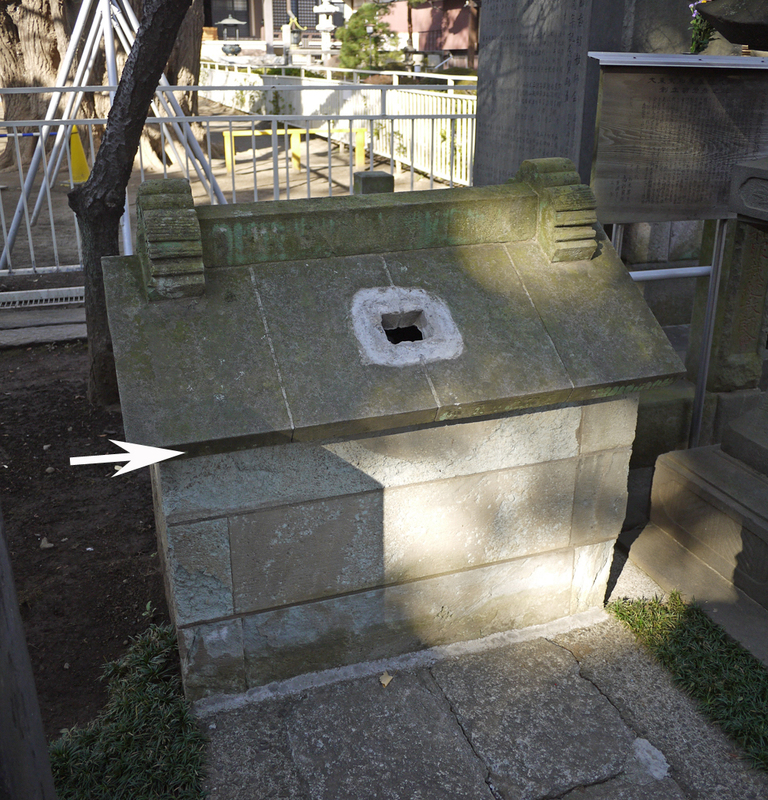 My friend who is also a stitcher and I joined women in kimono and men in glimmering robes inside the small temple. We were ushered in and we kneeled on pillows. 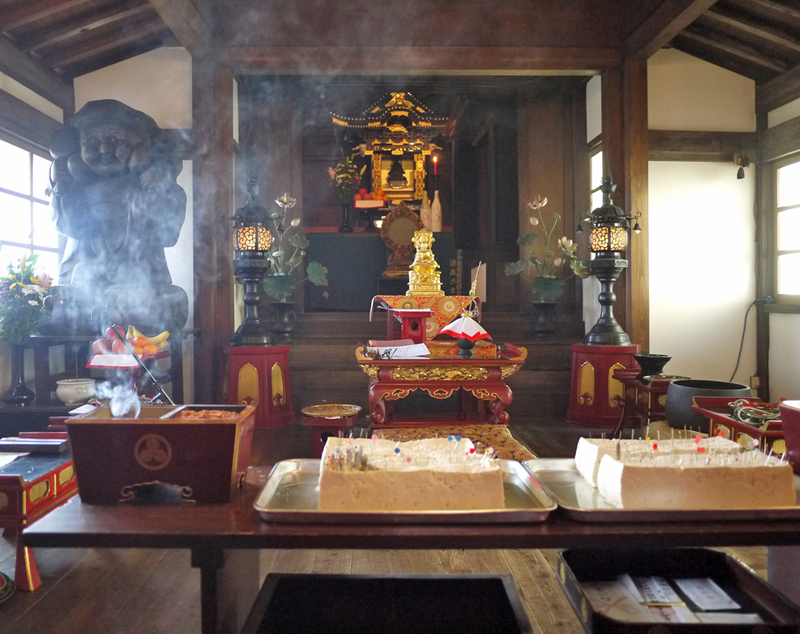 A box of incense passed our way and we were encouraged to pinch some into the embers and pray. We lined up with everyone and stuck our needles into the tofu. Then the temple ladies handed us sweet amazake. They reminded us it was cold outside, we needed to drink up, and handed us a second cup. 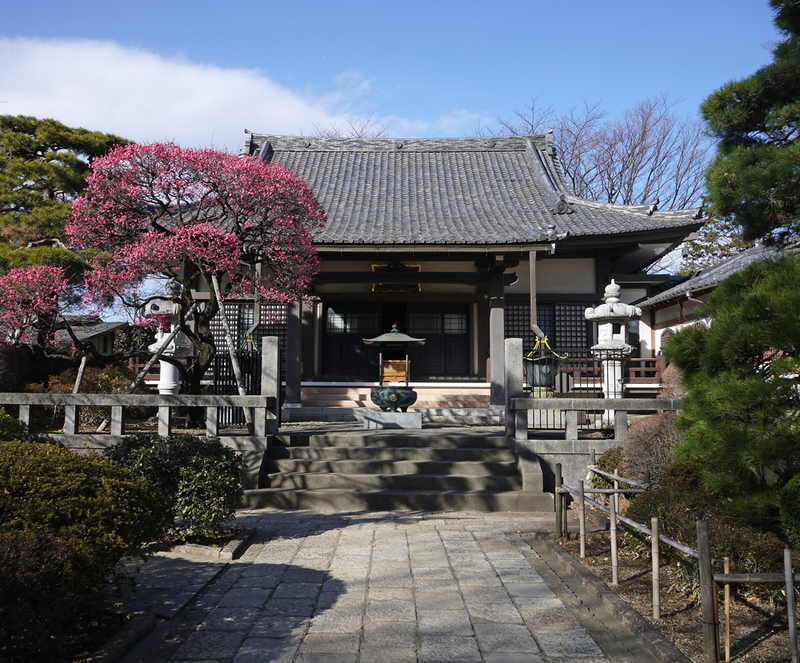 We strolled around the temple grounds, admiring the ume trees in bloom. It was cold, but a lovely day. Just before I placed my needle into the tofu I accidentally pricked myself with it, and it drew a little blood. He (yes, he) wouldn’t go without a fight. I felt some remorse about sending him to his end, so I hope I did right by this little needle in finding him a tofu bed. I bought a good luck charm from the temple to help me while sewing this year. I haven’t pricked myself since. 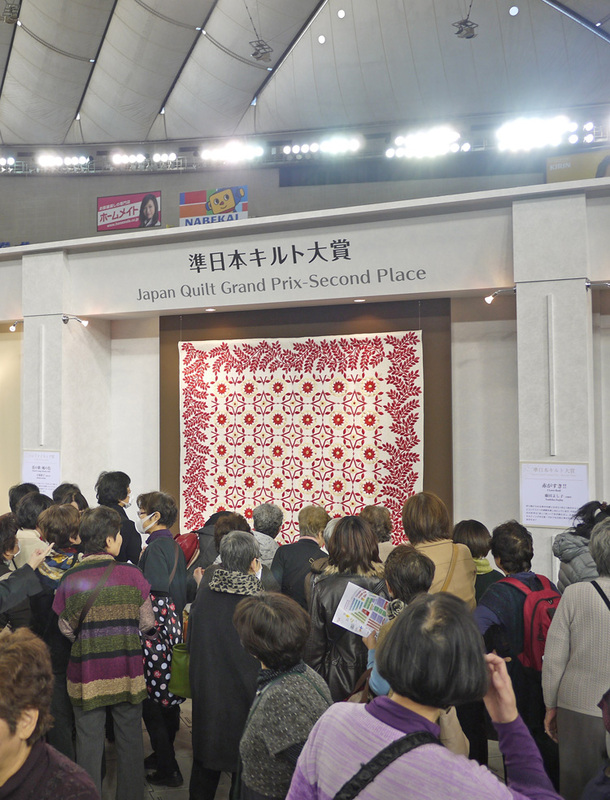 This week I visited the Tokyo International Great Quilt Festival. If you tell me something will be great, I am instantly skeptical. But this was great, at least for the few short hours I was able to withstand old ladies and their elbows. Don’t let those canes fool you, they are swift and deadly. In all earnestness, I had a lovely time with the old gals. My Japanese sewing vocabulary is well rounded, as is my ability to exclaim simultaneous astonishment and compliment with only mouth sounds (eeehhhhhHHHHH?! ), so we got along quite nicely. Occasionally someone would look over their shoulder to check for the Quilt Police and then gently lift the quilt to sneek a peek at the backside, and I’d crane my neck to catch a glimpse, too. We’d nod in understanding. You can always spot a fellow quilter or embroiderer, someone who is just as interested in the back as they are in the front. 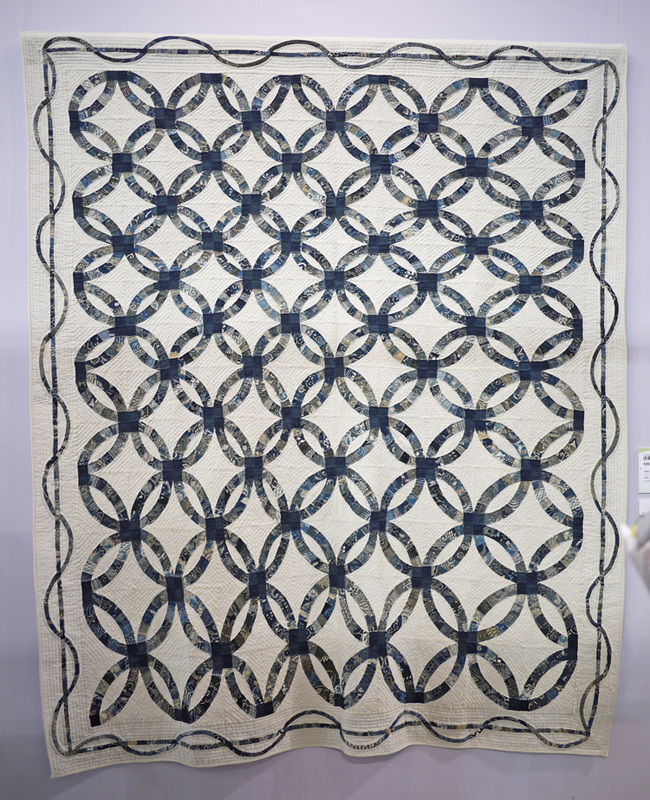 While most people were fawning over the traditional quilts, I really enjoyed the “wa” quilts category (和のキルト部門), described as quilts with a unique Japanese quality to them. 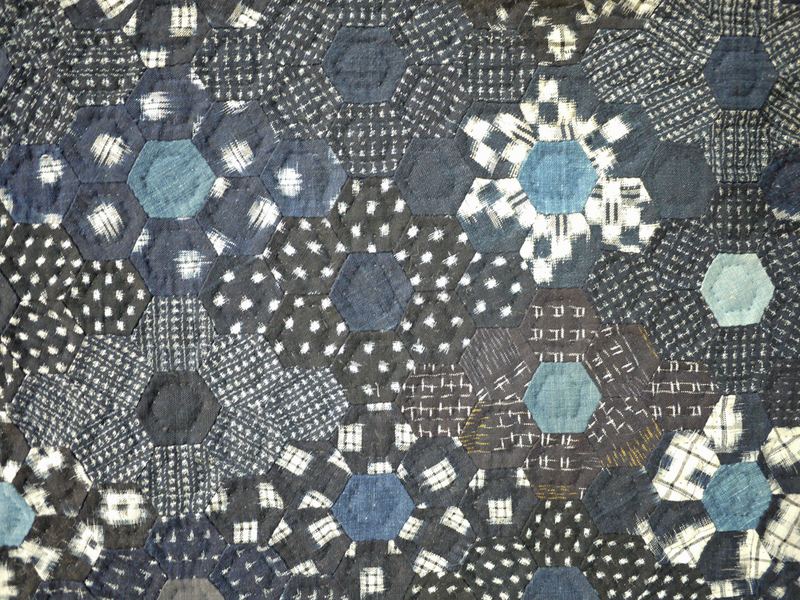 Many were constructed from Japanese kimono silk and were quite vibrant, but I prefered the naturally-dyed blues and grays of old ikat cottons. 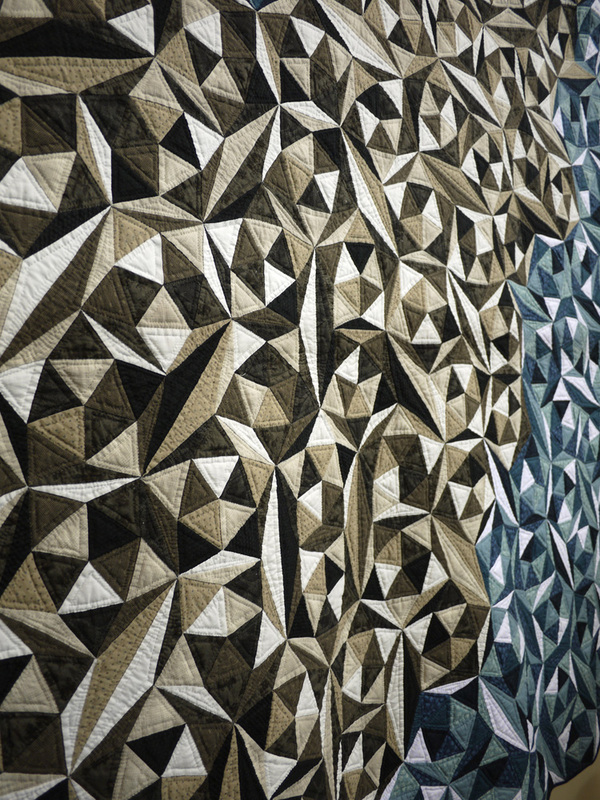 My favorite was this double wedding ring quilt. I was lucky to catch a moment with no one between it and me and I snapped a photo — I’m standing straight in front, but notice how the rings are different sizes. I wish I could have taken this one home with me. 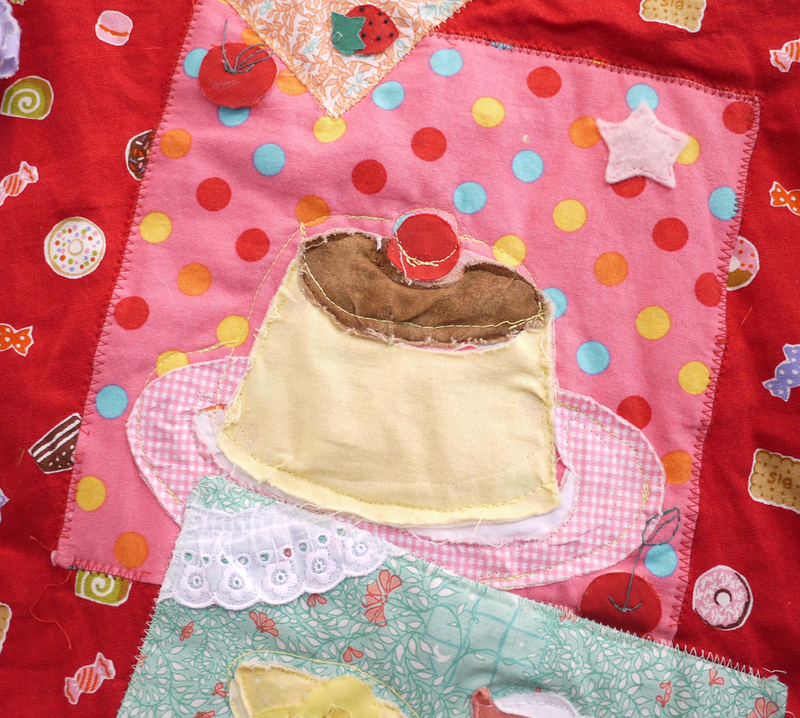 Another favorite of the day was the pudding quilt. Obviously. You can see more photos of my favorites here on Flickr. 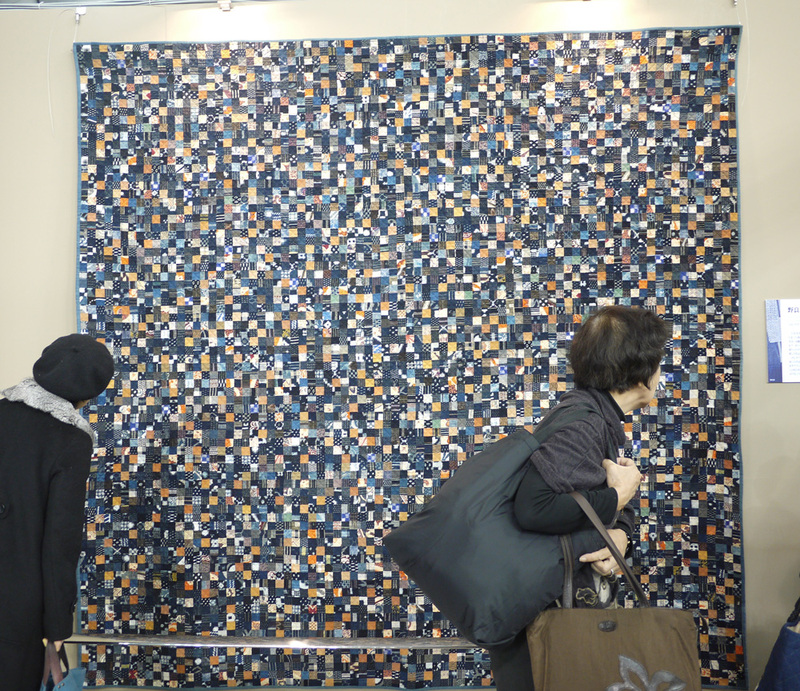 This was my first quilt festival — has anyone else attended one? How do you think it compares? I’d love to hear! 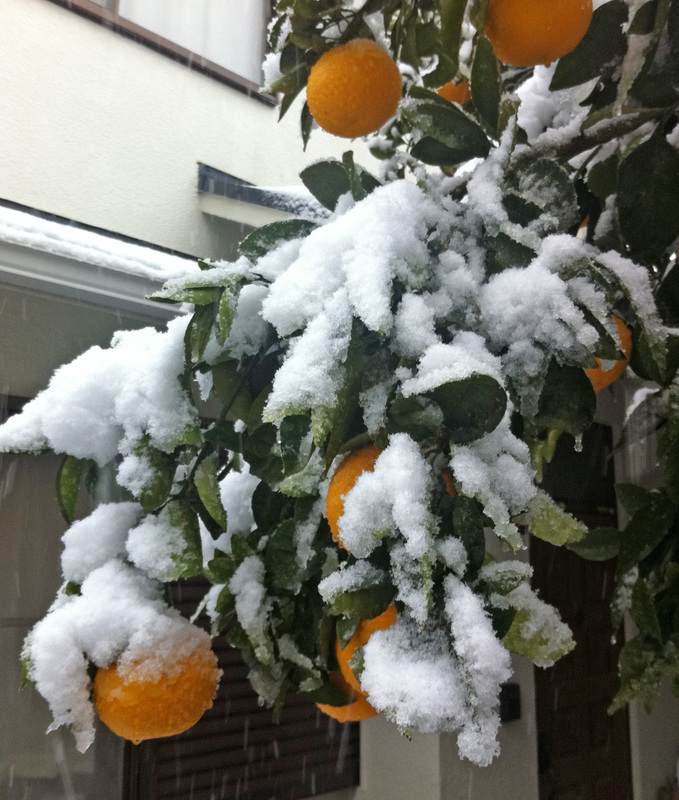 It is snowing in Tokyo! 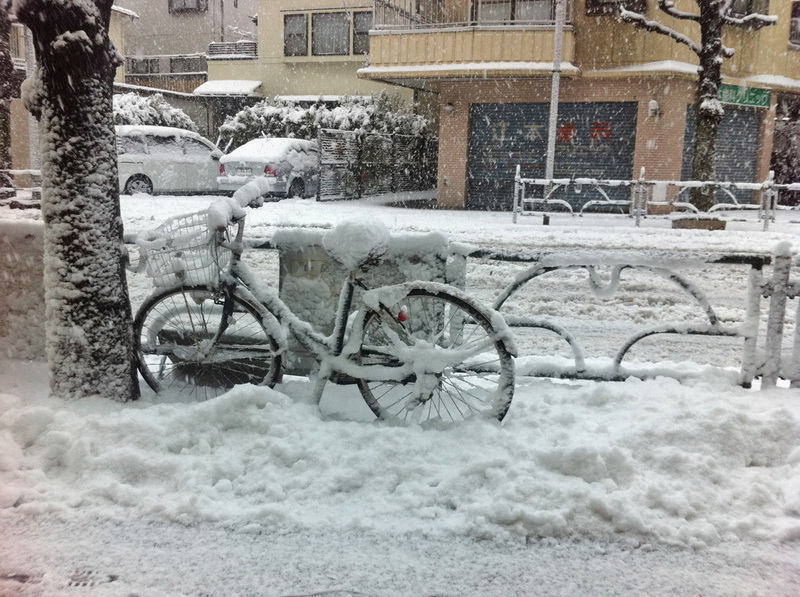 I love snow days, and after a brief snowball-filled jaunt to the supermarket I am giving myself free license to sit under the kotatsu and watch movies and drink tea until it is an acceptable time to watch movies and drink whiskey. Yesterday I ran into Tanaka-san while she was buying fried chicken, so I know she is set for the storm, too. Maybe I should suggest we combine our efforts. It looks like the other neighbors already have the mixers on ice. When I see a cat cafe in Tokyo, I try to peer in the window, but Ang says no, laughs, and then steals my candy. Ang is aggressively allergic to cats, and I’ve been denied, DENIED from entering cat cafes. But when a friend visits, there is great pressure to entertain. 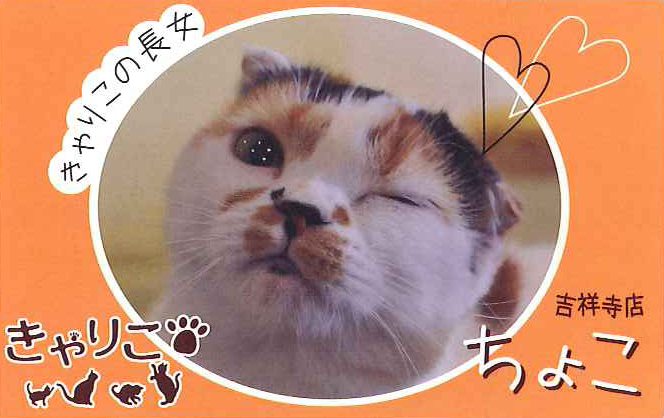 So while Ang worked, I took a visiting friend to a cat cafe in Shinjuku, and it was special. We wash our hands before we enter the cat room, take off our shoes, and put on a visitor badge. Is this a cafe, or an institution? We’re given instructions. Let sleeping cats lie. Do not suppress the cats. As an employee opens the door for us, a cat darts out into the entrance room, but then slows to a crouch. The cat knows it has nowhere to go. Forty cats lounge around a two-floor cafe. This is the nursing home rec room of a crazy cat lady’s dreams. The furniture is a bit slick, easy to clean I suppose, and the smell is akin to 40 cleaned cats. An unpleasant smell, but a clean version of it. A couple of young girls play Wii, ignoring the cats. The cats do just as good of a job ignoring all of us. Shelves on the walls and staircase give cats places to be out of reach of our frantically affectionate hands. I feel a bit like I’m in a remake of The Birds, but with cats. With cat eyes on us from above,we descend the stairs, and we descend into madness. Cats on totem pole constructions, cats on the counters, tables and shelves. I hear a cat snarl upstairs. Perhaps the Wii teenager has finally taken interest. Perhaps the Wii teenager is now dead. A young salaryman in a white shirt and black pants pulls a sparkled ball out of the toy box. He rolls the toy toward a cat, but the cat doesn’t move. The ball jingles as it hits the cat in the paw, but still, the cat doesn’t react. She just looks to her left, looking for something that isn’t us. We all laugh, and then move on to the next cat, which had hoped to be invisible in its stillness. We see you cat. We see you. Only one man seems to have mastered the art of affection. He is slumped in the corner on a floor cushion. His rumpled suit is too big for him, and six cats surround him. He stares ahead, paying no attention to the cats, or to us. He alternates between sipping his iced coffee, staring ahead, and pulling out pinches of shredded chicken from a plastic container. He barely looks at the cats as he feeds them, and he does not pet them. My friend tries to pet a cat, any cat. They wait for her to approach, and then dart off, trying to catch a few winks before someone else comes for them. “Come here, kitty. Come here.” There are equal parts frustration and joy in her voice. But the cats only speak Japanese. I know there must be a connection that can be made between the fragile situation in Japan and these precarious, lantern-covered wooden floats that lumber through the streets, pushed and pulled by a community, urged on by the chants and music from those too small to help. But what do I know? We ooh, and ahh, and are happy to be at our first matsuri in a new Japan.